Most battery companies don't focus on the substantial environment impact their products can have. From the production, to the packaging, to the post-life disposal. Nimble, is a different kind of charging and battery company, creating stylish products that limit their negative side effects. Nimble's product line is made up of power adapters, wireless chargers, and battery packs of all shapes and sizes. The product line is expansive, especially for such a young company. For the past several weeks, we've been using Nimble's massive 26,800mAh quad-output battery pack, the dual wireless charging pad, and the travel charger. Each of these share many similar design elements. For example, much is crafted from recyclable aluminum. This gives them a premium feel, great durability, and more use after the battery has run its course and needs to be disposed of. There is also a signature specked TPU material produced from eco-conscious bio plastics on the batteries which gives a great two-tone aesthetic and some solid grip. One last commonality we see through several of the products is canvas-like fabric created from hemp and recycled plastic bottles. Continuing on that eco-friendly trend, Nimble also uses recycled paper to package their products, and even includes a bag to recycle your old tech gear. Nimble says they will recycle one pound of e-waste for every product sold. Nimble has several battery options, ranging from 10,000 to 26,800 mAh in capacity. Our favorite is the massive 26.8K model that has four outputs: three USB-A and a USB-C. In this case, the USB-C port supports Power Delivery for 18W output, but it also doubles as the input to the battery itself. That leave you with three outputs if you'd like to charge the battery at the same time. Six LEDs are on the the side of the unit to check the status and remaining capacity of the battery. The first light glows amber or green, designating the current charging status — amber for fast charging, green for normal. 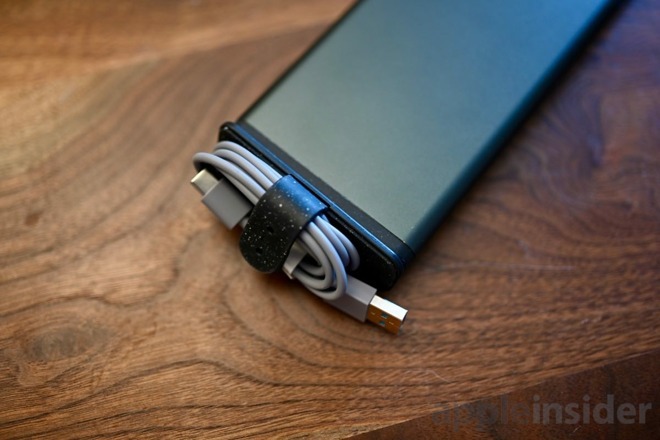 This battery pack, as well as all the others, utilize that USB-C port for charging, and include a USB-C to USB-A cable to do just that. It is wound up and stored, ever-so-conveniently, on the end of the battery. The cord is stored and held by a strap with a flat magnetic end that sticks to the battery. In use, this is more idealistic than practical. Using this day-to-day, the cable would constantly fall off, especially when tossed in a bag. Still, it was nice to have a cable tie handy for storage. In my current workflow, I'd have preferred more USB-C rather than USB-A. I've managed to move most of my devices to the new standard, leaving me without quite so many type A cables lying around. 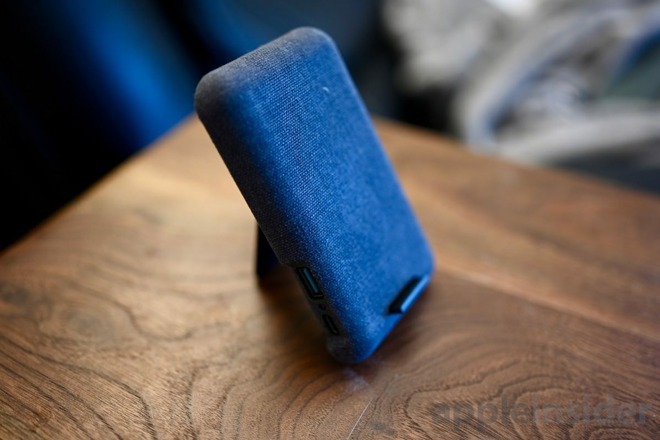 Aside from batteries, Nimble is also especially gifted in creating wireless chargers. We tested out three, with one easily topping our list as an all-time favorite. Starting with the basics, Nimble has an excellent dual wireless charging pad that keeps things simple. 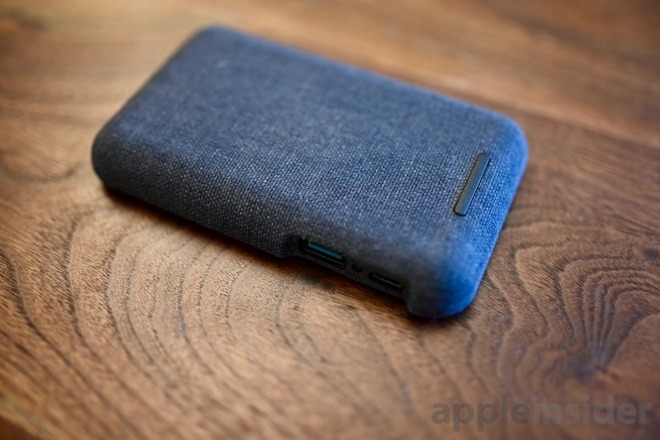 It has a USB wall adapter, USB-A to USB-C cable, and a large, fabric coated surface to charge a pair of iPhones on. All of these chargers are able to output 7.5W for iPhones, or 10W if you have a compatible Android device. We really see Nimble's materials shine here as the canvas material is very soft and grippy for your devices. The bottom is using that TPU material that consumes less energy to create than traditional plastics, uses the natural mineral mica, and lets every device look unique. Dual charger aside, their is a home/work charging stand. It converts from a flat pad, to a stand in two seconds thanks to the slide out shelf and pop open kickstand. 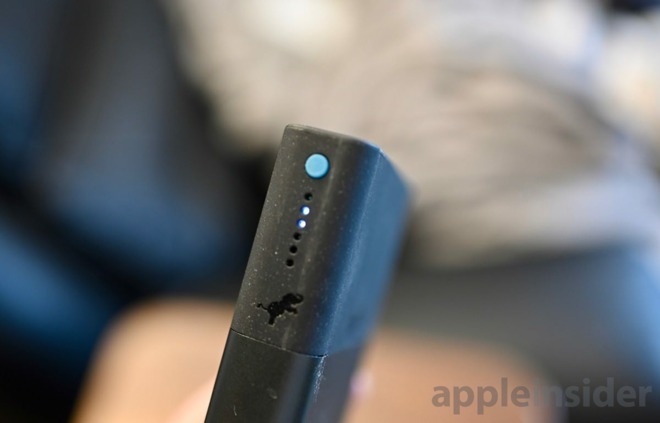 On the side, a bonus USB-A port helps charge a second device, such as perhaps an Apple Watch. Lastly, we have the travel charger. 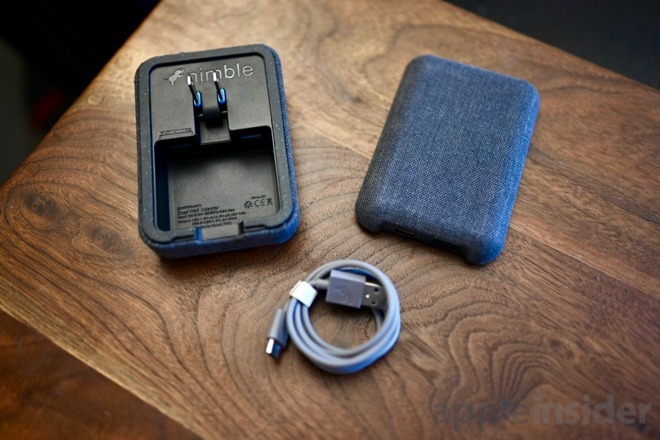 Nimble's charger is perfect for taking on the go, folding up into a compact package. Magnets come into play once more, holding the two haves together. One half is the charging pad itself, lying flat on the table. The other half is a bit of a shell with a semi-hollow interior for storing the requisite USB power cable. 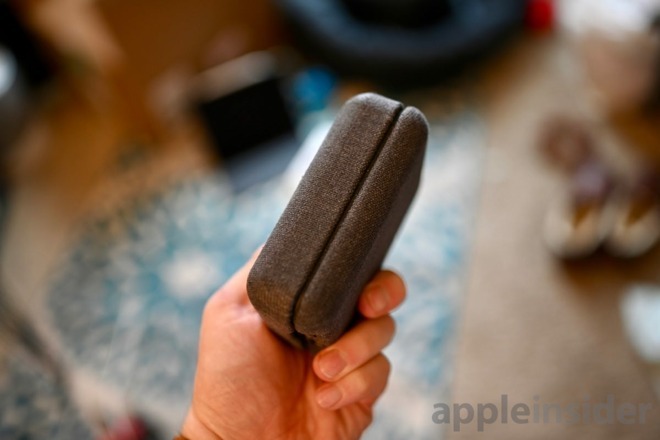 The power cable connects the wireless charging pad to the shell which doubles as a wall adapter with a pair of swivel out prongs. Making things better, are the extra USB ports. Both the side of the charging pad, and the inside of the wall adapter feature an additional USB port for charging an Apple Watch, iPad, camera, or whatever else you've brought along. With this small package, you can charge three devices at once. The only downside here is you don't get a charge stand, but rather a pad. Less ideal when trying to activate Face ID. Nimble has some some very serious intentions of elevating the charging game. With the pedigree of the founders we wouldn't expect much less. All of the batteries worked great and had several sizes to fit different users. 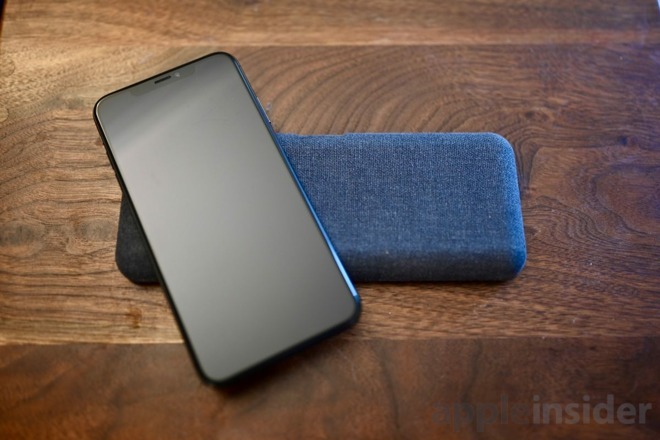 The wireless chargers looked equalky as handsome and we are in love with the soft-touch fabric. Amazon carries much of Nimble's excellent charging gear at comparable prices to the bigger names in portable power.